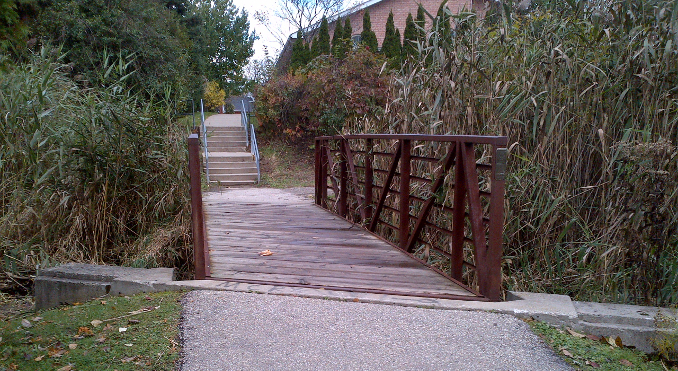 Is Your footbridge designed to fail? When designing trails within parks or green spaces, rivers and creeks become an issue. How do you cross them? A small babbling brook might be able to be jumped across or crossed by hopping between a few rocks to continue along the natural footpath. This style of water crossing is not that accessible, nor are these natural forest footpaths. Trying to walk across this type of water crossing can be hard for a person with limited mobility, an issue of our increasingly aging population. The next option is much more expensive, a bridge must be installed to cross a little creek to a larger river. The main materials for a bridge are wood, metal, and concrete. Each of these materials has its own design consideration; cost, longevity, maintenance, accessibility, access to the build site, just to name a few. In 2012-2013, I was tasked with reviewing bridge repairs suggested from the structural engineer’s bridge reports. I noticed that some of the oldest bridges (around 100 years old), required less work than some of the bridges 90 years younger. Were these 10 to 15-year-old bridges designed to fail? I’m not sure but I offer these few tips to help ensure the longevity of your assets. Water and salts, make an electrolyte, which allows for the current to move through. Sun, wind, moving water all create electric potential within the circuit/bridge. The foundations create “Ground” and can complete the circuit. Lesser “noble” metals protect more “noble” metals will. Protection: oxidizing or rusting gives off an ion to join with oxygen to maintain the electric potential equilibrium. Stainless steel will oxidize faster than silver. If you have weathering steel fasteners on a stainless steel structure, the fasteners will oxidize, rust and fail at a much quicker rate since it is trying to protect the stainless steel – as known as- equalizing the electric potential. If you think about bridge design in this fashion, small items requested during the tender process and good maintenance can help to ensure the longevity of the bridge. 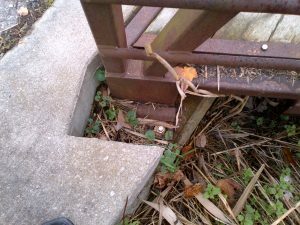 Weathering Steel Bridge with wood deck with overgrown vegetation surrounding bridge – designed to fail? Weathering steel (core-ten) must be placed in a full sun area that will allow it to dry completely each day. This repetitive wetting-drying cycle forms a very uniform, thick protective layer of rust with a constant colour. Design the weathering steel bridge, with a minimum 2 meters (6′ feet) above the water. 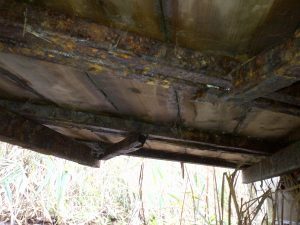 Ensure the bridge is electrically broken from the ground (foundations) and into smaller units. Electrically insulate all connection points with dielectric insulating bolt sleeves and washers (PVC, rubber, ceramic, etc). Keep all vegetation cleared around the bridge to ensure the wind can dry the bridge throughout the day. Ensure leaves, dirt, and debris are cleared from the bridge, especially the bridge connections. 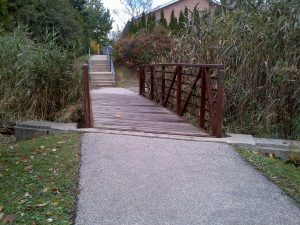 If the above recommendations cannot be maintained, it might be a better idea to use another material, such as wood or concrete if you don’t want to replace your bridge very 10 to 15 years at over $10,000 for a small 6-meter long bridge. In future blogs, we will look at other materials and design considerations. If you need help designing your trails, locating your water crossings and types, creating tenders for bridge replacement or help to create maintenance procedures, please give us a call or email, we would be happy to help. If you like our posts, sign up for our blog and it will be emailed to you as soon as it is posted. Saving you time and energy. Is your development site designed with snow in mind? I’m one of those weird ones that like winter. Snowshoeing deep into the forest. Cross-country skiing under the clear blue winter sky. I even like the great workout I get, when there are a few inches of the white stuff freshly fallen from the sky. I was taught in school that within most of Ontario, parking lots can lose up to 20% of their parking lot space to snow piles. That is about one space out of five, lost to snow! Luckily, most of our snow falls after New Year’s Day. But, early, before the Holiday Seasons, snow falls can eat up lots of parking space for those crazy last minute shoppers (like myself). Where are the possible starting points for the contractor to enter the site and start pushing the snow around? Does your site have more than one entrance? Are there clear paths to push the snow to an end aisle? Will vehicles be parked overnight? Will conflicts occur between the snow windrow around the roads and/or large snow piles with the drive aisles and the pedestrian walkways? Are the walkways wide enough that the snow removal contractor can drive his/her truck and quickly remove the snow? Will they need to snow blow / hand shovel? Where is the snow going to be piled or will it be trucked off site? 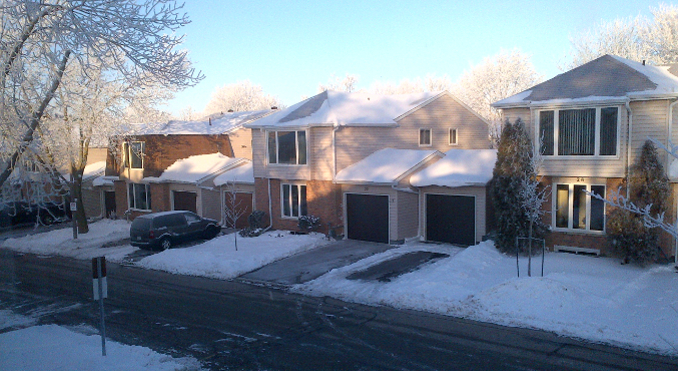 As a landscape architect, with experience with snow removal, I can work with your site design consultant team to improve your parking lot and landscape design to ensure less space is lost to snow. Hope these discussion points help to improve your site during winter. Feel free to send us any questions you may have about your site, especially if it is still in the design phase. We would love to hear your comments about our blog and any Site and Landscape Design topics you would like to hear more about. Desire Lines – Part 1 – Why do Mud Paths Form? Have you ever wondered why people just walk across the lawn or parking lots even when there is a formal hard surface path near by? After a while, this short-cutting creates a muddy path in the lawn or pedestrian and vehicle conflicts? So why does this happen? Why do designed pathways sometimes fail and not operate as planned? How do you keep the pedestrian to the intended path? Provide some suggestions to help make your site more pedestrian friendly during the design stage. First off, pedestrians unlike cars, are very chaotic! Pedestrians prefer the shortest and easiest path of travel and will walk over obstacles upwards of 300mm (12”) high, steep hills, and through planting beds, if they believe it will be less effort (see Image 1). Vehicles, on the other hand, are much easier to control, as they prefer hard packed paved surfaces, but that is another discussion for a future blog. So back to the pedestrian. Image 1 – Desire line – a mud path has formed leading into Victoria park, Kitchener. This path is created from many people desiring access into the park at this corner. As I mentioned above, pedestrians love the shortest and easiest path that allows of safe travel. During the planning stage, as your design team is starting to workout the layout of the parking lot, have a round table discussion with your landscape architect, traffic consultant, and architect. Define the goals for the site to be more pedestrian and alternate transportation friendly. I bet it is usually from the points of access to the front door in the safest and quickest method? Highlight these routes on your plan as the preferred pedestrian corridors. Next look at how the vehicles will more through your site. How do vehicle access the the site, how many, for what reason? . Where do the delivery vehicles need to go? Can they access the site from all the adjacent roads? Where are the high traffic areas for pedestrians and vehicles? Remember to place safe holding areas for pedestrians near areas of high traffic conflict, such as the main doors and main drive aisles. Raised walkways, zebra striping, rumble strips, signage, and anything to make the area feel smaller and more visually cluttered to vehicle drivers will help to reduce the speed of traffic and increase driver awareness. To help slow the traffic, you can model a busy downtown street with lots of street shopping and cafes. The vehicle speeds will be much closer to or lower than the posted speed (see image 2) compared with the major highways (interstate). Image 2 – Downtown Blenheim – note the even the road is wide, many cars are parked on the side of the road, the shop frontages are busy with signs and other details. All these elements reduce the speed of the vehicle traffic and help to reduce accidents. I believe, if the pedestrian feels safe using your site, especially one with accessibility issues, they might drive a little farther to visit the shops at your site, which will result in higher sales. What if we start thinking and designing commercial sites to be more park and less like an efficient industrial sea of asphalt and concrete used for parking? As a pedestrian moving through different sites, what parking lots do you dislike the most and why? Email us your comments at info@beyondthepost.com. Sign up for our newsletter In future blogs, I will post ideas to help control and slow vehicles down, provide additional ideas control pedestrian movement to areas you prefer them to be and away from areas that you do not what them to be. Feel free to drop me a line, if you have any questions or comments info@beyondthepost.com. Does your landscape project require a permit(s)? Is your park a natural fitness gym?